The Sena Bluetooth Pack for GoPro is a specially designed adapter for the GoPro Hero3 allowing for Bluetooth capabilities. With the use of Bluetooth headsets, the Sena Bluetooth Pack for GoPro allows users to add their voice to the video on-the-fly using Bluetooth Audio Recording feature. Being able to narrate the video during recording not only provides users a whole new experience but also reduces the need for follow-up audio editing allowing for in the moment audio experiences. It is designed to connect to both Sena and non-Sena Bluetooth products allowing users to pair their vocals with the video. With Sena Bluetooth products, users may add not only their own voice but also audio from their companions through the use of the intercom to create a mixed audio experience. With the use of Bluetooth headsets, the Sena Bluetooth Pack for GoPro allows users to add their voice to the video on-the-fly using Bluetooth Voice Recording feature. Along with their own voice, users can include audio from their companions through the use of the intercom to create a mixed audio experience. Being able to narrate the video during recording not only provides users a whole new experience but also reduces the need for follow-up audio editing allowing for in the moment audio experiences. Sena’s Bluetooth pack for GoPro is equipped with Bluetooth headset pairing with both Sena and non-Sena Bluetooth headsets. Along with Sena Bluetooth products, users may enjoy the intercom conversation recording, longer Bluetooth working distance, and more delicate control of the pack, while they can still use the feature of Bluetooth Audio Recording when they use non-Sena Bluetooth headsets. The ability to pair with a Bluetooth headset allows the user to maintain communication and record conversations through the intercom. Sena has integrated voice prompts into all of the units to ensure users can maintain handsfree control. Voice prompts allow users to operate functions without needing to take their hands off of the handle bars. Sena provide voice prompt options for multi-language, English, French, German, Italian, and Spanish.This is necessary to ensure safety is maintained during times of traffic or congestion. All Sena products are firmware upgradeable and it allows Sena products to always operate at their peak and have the most up-to-date functionality and options for rapid technological advancements in smart phone and Bluetooth devices. The firmware upgrades are available for free when available to all registered Sena customers. Note: GoPro camera sold separately. how to get great audio and voiceover for videos! I can't say enough positive about this product. First off this isn't just for video vloggers either. If you have ever taken footage with either one or more GoPro's then this is what is needed to add extra very clear audio. I have it mounted to the back of one of my Hero 4 GoPro's on my dash looking straight at me. Then with the other 2-5 GoPros mounted on or around my bike I will use this to add "commentary" to the scenes that are going on around me I have filmed. If you use the Sena headsets you can also record additional audio from up to 2 other people in "intercom" mode. So as you are passing by something you are taking video from you can use the audio from others you are riding with also to add "flavor" to the video. Here is one of the only setbacks...If you plan on listening to other audio (Radio, music) from your smartphone. You have to switch this off as it won't let you record that (copyright infringement). Also...you can use this pack to record audio directly from the go pro if you don't have a bluetooth radio headset you want to record from. It's better than the built in mic from the GoPro but I don't hardly use it that much. One last additional suggestion. There is a waterproof case that you can buy separately, get it extra. Especially for when you are going to be in the rain so you don't break that $400-500 GoPro. I love this unit and there is so much you can do with it and the audio is wonderful. I bought this product to get into a little amateur moto vlogging. I didn’t want to run a second wired mic off of the go pro (hero 3) . After reading the instruction and pairing it up to the Sena and the go pro it worked pretty well. While running the Bluetooth backpack you can hear some static in your ear piece but it doest show up in the video audio. Seems to crash when you try to do dual vlogging with another bluetooth set, but I rarely do that so its not a problem. Overall a good product from sena that I would recommend to others to buy and try. Using a Schuberth system. Works okay when solo, but every time we tried to get the group conversation linked, it would freeze or crash the GoPro Hero 3+ Black. Only got it to work 1 day during the trip. We were all very excited to use this on our trip. It was quite the let down. Solo works great. never any issues connecting. But I didnt buy it to record solo films. I'm using a GP-10 with a Hero 4 Silver. I've had nothing but trouble with the unit. The main issue is it hangs / freezes / crashes my GoPro. I've missed far too many once in a life-time events because my GP was frozen. I asked for a replacement unit from Sena and received it. However the problem persists with the additional problem of popping / hissing noises. Sena support is very substandard. Slow response or canned responses. Easy to use and works really well. It records my voice via wifi/bluetooth to the Gopro camera without issue...recommend a helmet that keeps out the wind noise. I am always amazed how fast stuff shows up at my door when ordering from Revzilla! This GoPro mic attachment is really excellent. It captures my voice and that of my fellow riders very well and automatically. Now I can capture the fascinating dialogue that takes place over our SENA headsets or, should I develop a love for my own voice, I can vlog like some of the guys on Youtube who clearly have no mental filters. The controls could be improved for access in the waterproof case, but I suspect later versions will address that. This and the SENA headsets are some of the best equipment I have owned for riding. Easy to configure and use. I like the fact that you can plug the charger into the bacpac and it charges the GoPro at the same.time. I haven't used in the wild yet but in preliminary testing it has been great. Wonderful idea and compact enough that it is not intrusive. Convenience and flexibility - no more cables to record vlog voice. Easy to connect and operate with cell phone and Sena 10S. Adds a small amount of bulk to the GoPro but easy to operate. I have Sena SMH-10 headsets on my helmets and I wanted better audio on my GoPro. The ability to record the intercom conversation and control the GoPro with voice commands is a huge plus. 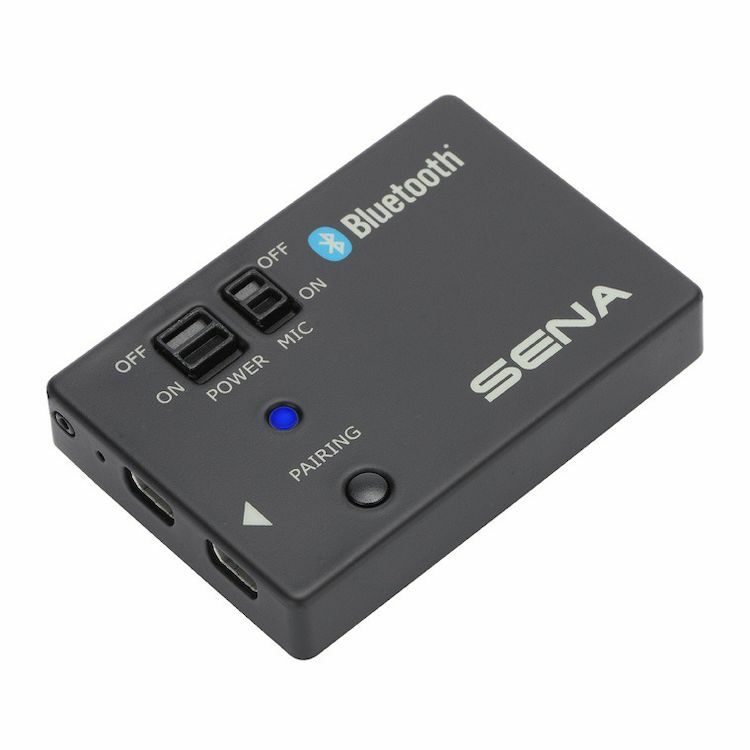 To bluetooth with my Sena SMH10 so I can record my voice and conversations with other bikes. I am thinking about using my new Sena 20S to connect to my GoPro for audio. Wanted to be able to do commentary on GoPro video from my Sena BT helmet system. Haven't even had a chance to test it yet. Still waiting (over 6 weeks now) for the availability of the waterproof housing from Revzilla. May have to look elsewhere, as they seem to be available from time to time from other sources. Hope I have it by 25th, as I'm heading to a track class and would like to use it there. This item fills a roll and a need that has not been addressed by GoPro. This Accessory enables a gopro user to add his/her spoken voice to the video in real time. Previously one had to modify one's gopro housing to accommodate a 3.5mm jack and wear a wired mic or edit in an audio file afterwards. As the "Bluetooth" in the nomenclature suggests. This pack snaps onto the back of a gopro cam and establishes a Bluetooth link with the mic in one's helmet or other type of com system. Love my new gopro and really want to narrate and start some motovlogging...this along with the headset seems like the most unobtrusive way and I love new tech! I recently purchased the Sena 20s from me and my wife and realized that this is needed to add the audio overlay while recording on the gopro. Without this part there is no audio overlay and no narrator. Well, Revzilla rocks, they have the best web site, best selection, best prices, best information, "infomative vids" and blazing fast shipping...and the go pro-sena is the best addition to my go-pro kit. All that said, I am going to make moto-blogs on my new 15 FZ-07 and 15 FJ-09. Thanks Revzilla!! I have the smh-10 and i motovlog, so I want to be able to do it wirelessly. Eliminator of wires. Gotta have it. Does it work for the gopro hero 5? BEST ANSWER: No. It's not modified yet for that model. Does it work with my GoPro 4 Black edition? can the sena gopro back be used with a gopro hero 4 silver and sena smh10r? BEST ANSWER: According to the description above under features and Sena's website, yes. I'm having trouble playing audio from my phone into the Sena 3S, while recording audio from the Mic from the 3S to the backpack on the gopro. Is this even possible? BEST ANSWER: No it's not. They did this because that would mean you could record music and that's getting into copyright infringement. so it blocks out all other means of audio input besides you and anyone else that you are using the intercom feature with your sena headset with. I understand this product works with the Hero 3 and 3+ but now that the Hero 4 has come out, will it work with it? Assuming my intercoms support multiple links in an open conversation, how many headsets can be recorded into the Go Pro? I have seen videos of 2, but what about 4? 8? BEST ANSWER: I don't believe that you can do up to 8 yet I think it's only 3 others so there are 4 of you being able to have your voice recorded. It's on the sena website if you look for the GP10 unit. Up to 8 20S can be recorded. Can I still listen to music on my SENA (through my phone BT) while I'm recording audio through the bluetooth? I understand this Sena GoPro Kit comes with a frame case, but is there a waterproof case available that will fit the audio connector that sticks out of the side? BEST ANSWER: I have been told that Sena will be coming out with one soon, but the GoPro cases will not work because of the audio connector. Yes, I understand. I also ordered a waterproof case. is there a fully waterproof case available to purchase that fits the gopro and all the required bluetooth bacpacs to use a wireless bluetooth mic? BEST ANSWER: Yes. SENA markets a clear plastic waterproof case, much like the gopro case except this one fits the gopro with the sena Bluetooth mic. I purchased mine on revzilla, it went backorder and had to wait for it. It eventually came though. I am surprised you didn't see it on revilla. I asked myself why you did not see the case (a waterproof case for the gopro with the sena Bluetooth backpack) listed on revzilla. Then it occurred to me that you were probably looking under gopro accessories. You will find the case listed under SENA accessories. Not out yet but yes there is. Have them email you a notification when it arrives. Search for sena products on revzilla and you will see it. Sena makes a waterproof case for the GoPro and backpack. It's new and has not been released yet, maybe by the end of June. Yes there is. Just type I'm waterproof case for GoPro with Sena and it should pop up. I'll be buying one soon. Yes there is a waterproof case along with a separate skeleton back door. This device will record conversations to Go Pro between 2 headsets, but can it record 2 headsets to 2 Go Pros if I have a GP10 on each? BEST ANSWER: Yes it will work for both because you are going to set them up so each of the riders with a radio is a "primary" for each unit. Then you will "intercom" to the other rider in which the pack will now record both of your audio. So in essence both of you will have the same audio recording to each GoPro but the video will be different (obviously) because of the GoPro's themselves. If I understand correctly, Rider A has a Gopro with a GP10 linked to A's headset, Rider B has a Gopro with a GP10 linked to B's headset. When A and B talk to each other, the conversation will be recorded on the soundtrack of both GoPros. Both sides of the conversation recorded on both GoPros. Sorry, I can't answer the question I only have one GoPro.